One time only donation of $890.00 includes beautiful legal diploma suitable for framing, free ordination, wallet card, entry in Practitioners Directory, lifetime reference service, etc. Priority Mail shipping is included. Description: You may choose a second PhD title for a double major. The second degree is half-price. Also use this button if your spouse is applying for a degree at the same time as you. If you want another degree instead of a PhD for your second degree, that one is also half price. Email us for instructions. Your degree and ordination credentials both come in miniature, used as a wallet ID card to verify doctoral or minister status. CURRENTLY OUT OF PRINT. We are working on getting it back in print. Email us for alternative book suggestions. OR Add to Cart if you want a scanned PDF file of each chapter which we are soon to have available] An Interfaith Minister’s Manual by Angela Plum is a collection of ceremonies, services, rituals, prayers, and vital information from the world’s major religions in this beautiful hardback manual with white cover stamped in gold-foil lettering. 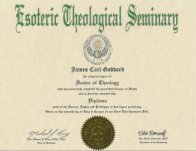 One time only degree fee of $740.00 is offered to those clergy who have already been ordained by our Seminary. Priority Mail shipping and a wallet card are included at no cost!